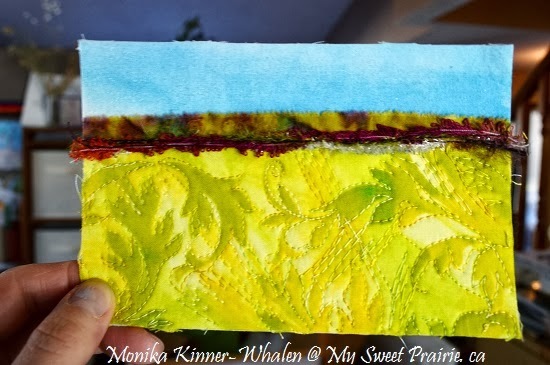 My Sweet Prairie Studio / Art by Monika Kinner-Whalen: It's Postcard Time! 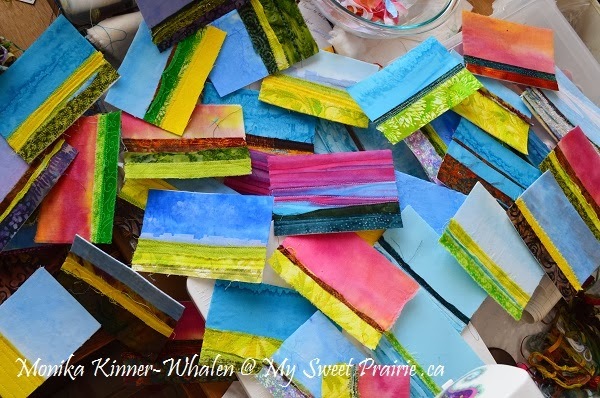 I'm in a postcard frenzy - whipping out some bright colors in anticipation of the end of winter. I am highly motivated by the onset of spring. So.. about 75 cards in the making. These will be for the SK Craft Council Boutique, and I'll likely frame some up for shows I have before the summer. The color schemes are put together - no two alike. Now I'm addign the stitching, mostly simple machine work and some couching. This is my fave - fabric from my friend Carmen (LOVE this color to no end!!). Linking up to WIP Wednesday @ TN&TN. My apologies about the font & format - not sure what happened. Inlink changed, I didn't. ? hmm..
Ooh! I am actually peeking through my fingers at today 'cause it is making me think spring! :) Bring on the pink skies! Lovely postcards! Has me seeing blue skies on a cloudy day! Love these bright colours! Looks like you are really enjoying yourself with them too! You make it look so easy Monika. 75 cards! Wow! Love all the bright springy colours. What a delight to see all those bright colours. I can't wait to see how they look after you've finished your stitching. There's one in particular I'll be keeping an eye on.